"But they are all terrorists, aren't they?" -- President-elect Ronald Reagan at a Nov. 19, 1980 briefing by CIA operatives who tried to explain the different Palestinian factions involved in the Arab-Israeli conflict (Pages 249-50) in "The Good Spy"
That comment by Reagan provoked eye-rolling by members of the Central Intelligence Agency (CIA), says Kai Bird in his magnificent account of Robert C. Ames (1934-1983) in "The Good Spy: The Life and Death of Robert Ames" (Crown Publishers, 448 pages, photos, maps, notes, bibliography, index, $26.00) but later events -- including the April 18, 1983 suicide truck bombing of the American Embassy in Beirut, Lebanon that killed Ames and 62 others -- may make Reagan's comment more prescient than the nuanced formulations of more sophisticated intelligence operatives. Bird says the bombing was carried out by Shi'a Muslims led by a young intelligence officer of Iran's Revolutionary Guard, who -- amazingly -- was provided a new identity by the U.S. and is alive today in the U.S. In a summation in the epilogue, Bird says: "Robert Ames believed that a real peace was possible [in the Middle East]. The Middle East need not remain a perennial battlefield. He used his intelligence and charm to begin the peace process in the shadows of Beirut. His clandestine work was a catalyst for that symbolic handshake on the White House lawn. He was the good spy. But his work remains unfinished." (Page 355). The April 18, 1983 attack was a geopolitical turning point, says Bird. It marked the beginning of Hezbollah as a political force. Even more important, it eliminated America’s most influential and effective intelligence officer in the Middle East – Robert Ames. What set Ames apart from his peers among the Arabists at the CIA was his extraordinary ability to form deep, meaningful connections with key Arab intelligence figures. Some operatives relied on threats and subterfuge, but Ames worked by building friendships and emphasizing shared values – never more notably than with Yasir Arafat’s charismatic intelligence chief and heir apparent Ali Hassan Salameh (aka “The Red Prince”). Ames came from a working class Philadelphia background and fell in love with Arab culture much the same way that Englishman T. E. Lawrence ("Lawrence of Arabia") did decades earlier. While many C.I.A. operatives considered places like Yemen, Aden, and Saudi Arabia, "hell-holes" -- preferring London, Paris and other locales -- Ames welcomed postings to places where he could interact with the locals. Senior Mossad -- the Israeli counterpart of the CIA -- agent Yoram Hessel called the 6'-3" tall Ames "an American Lawrence [of Arabia ] a Lawrence with with Stars and Stripes." (T.E. Lawrence was about a foot shorter than Ames). Hessel and other Mossad operatives got along much better with Ames than they did with other CIA Arabists. But Hessel said of Ames that his love of Arabs and their language and culture came "with considerable baggage….Empathy in intelligence can be dangerous … An intelligence officer is not an advocate. When Ames came to Tel Aviv, his job was to listen -- and to see if what he knew measured up to reality. But he was clearly emotionally involved with the Arab world. We were always aware that he was presenting things through a certain lens. We didn't see him as an adversary -- but he certainly came from a different place." (Pages 240-241). Ames’ deepening relationship with Salameh held the potential for a lasting peace. Within a few years, though, both men were killed by assassins, and America’s relations with the Arab world began heading down a path that culminated in 9/11, the War on Terror, and the current fog of mistrust. 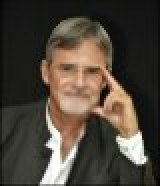 Bird was a natural to write the story of Robert C. Ames, not to be confused with CIA counterspy Aldrich Hazen Ames, who was convicted of spying for the Soviet Union and Russia to fund his living beyond his means lifestyle. 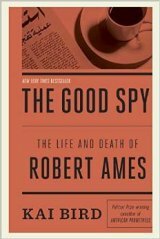 Bird -- who knew Bob Ames as a neighbor when he was twelve years old, when Bird's father was a foreign service officer in Saudi Arabia -- spent years researching "The Good Spy." Bird says at the beginning that he didn't get official cooperation from the CIA, but he did interview dozens of CIA operatives -- many of whom are disguised with pseudonyms -- as well as current and former Israeli and Palestinian intelligence officers. He was given the first access to hundreds of Ames' private letters by Yvonne Ames, his widow. Bird was the first journalist or historian Yvonne Ames spoke to. Kai Bird is a Pulitzer Prize-winning historian and biographer. His last book was a memoir about the Middle East entitled "Crossing Mandelbaum Gate: Coming of Age Between the Arabs and Israelis 1956-1978"(Scribner, 2010). It was a 2011 Finalist in the National Book Critics Circle Award for Autobiography. He is the co-author with Martin J. Sherwin of the Pulitzer Prize-winning biography, "American Prometheus: The Triumph and Tragedy of J. Robert Oppenheimer" (2005), which also won the National Book Critics Circle Award for Biography and the Duff Cooper Prize for History in London. He wrote "The Chairman: John J. McCloy, the Making of the American Establishment" (1992) and "The Color of Truth: McGeorge Bundy & William Bundy, Brothers in Arms" (1998). He is also co-editor with Lawrence Lifschultz of "Hiroshima's Shadow: Writings on the Denial of History and the Smithsonian Controversy" (1998). He is the recipient of fellowships from the John Simon Guggenheim Foundation, the Alicia Patterson Foundation, the John D. and Catherine T. MacArthur Foundation's writing fellowship, the Thomas J. Watson Foundation, the German Marshall Fund, the Rockefeller Foundation's Study Center, Bellagio, Italy and the Woodrow Wilson International Center for Scholars in Washington DC. He is a member of the Society of American Historians and a contributing editor of The Nation. He lives in Lima, Peru with his wife and son.